Tiny but fearless, affectionate but playfully curious, the Maltese is the ultimate companion dog. This toy breed is one of the oldest dog breeds in the world, and as such, is well-adapted to both humans and other animals. They’re easy to take care of as they’re such people-pleasers if trained properly, but don’t let the innocent appearance of this pup deceive you – they are lively, spunky little dogs who are not afraid to challenge those larger than them! Malteses do love to be pampered though, so it can be a bit difficult to find the right dog food for them. For these dogs, nutritious and good-quality foods are just a part of the puzzle – to please them, you need to find a food that lives up to their high standards. It needs to be delicious, full of flavor and easily digestible. Plus, there are a few health problems you need to look out for and make sure the dog food is actually working for your Maltese’s health and wellbeing, not against it. To help you find foods that do just that, we’ve done our research –below, you can find the best dog foods for Malteses that are delicious, nutritious and budget-friendly! In order to be healthy and happy, Maltese dogs require a balanced ratio of macronutrients – protein, fat and carbohydrates. 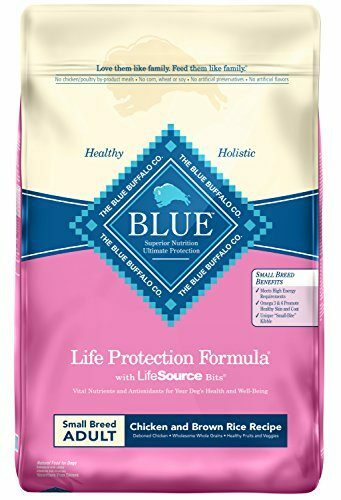 This dog food from Blue Buffalo is formulated specifically for small and toy breed dogs such as the Maltese, so it’s our first choice. Chicken and brown rice recipe make for a delicious and healthy meal, guaranteed to satisfy your little furry companion. This kibble features protein-rich, deboned chicken as its first ingredient, as well as whole grains, rich in vitamins and minerals, and various vegetables and fruits. Basically, it’s a health-bomb for dogs! Of course, the kibble is also enhanced with minerals and vitamins and contains a unique blend of added antioxidants, which all help support the Maltese’s immune system and healthy muscle development. There are no by-product meats here, so you know exactly what you’re buying. Also, the kibble is corn, wheat and soy free, as well as artificial flavors and preservatives free. If your Maltese has a sensitive stomach and maybe even some food allergies, it’s a good idea to feed her only grain-free, good-quality foods. 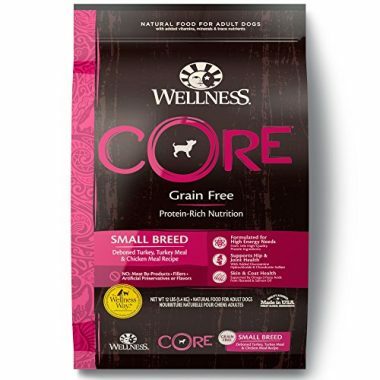 That’s where the Wellness Core Small Breed dog food can help you – this kibble contains only the best of ingredients, no grains of any kind, and is a favorite food of many Malteses as it’s so darn delicious! This is a deboned turkey, turkey meal and chicken meal recipe, meaning a kibble that is rich in protein, perfect for dogs with high energy needs. Besides good-quality meats, it contains a bunch of healthy whole foods, such as spinach, broccoli, carrots, apples, blueberries, flaxseed, sweet potatoes and others. It’s also fortified with vitamins and minerals, so it’s guaranteed to offer a nutritionally complete meal every time. Since this is a by-product, wheat, corn and soy-free kibble, that’s also free of artificial colors, flavors and preservatives, it’s perfect for Malteses with sensitive stomachs. All puppies need a healthy, nutrient-rich diet to help them grow strong and healthy, and Maltese puppies are no exception. 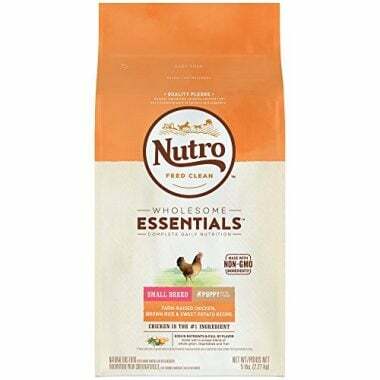 With a perfect ratio of protein, fat and carbs, this Nutro Wholesome Essentials is one of the best foods for Maltese puppies on the market as it’s specially formulated for small breed pups. 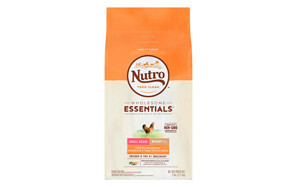 Made with farm-raised chicken, brown rice, sweet potatoes and a unique blend of whole grains, veggies and fruits, this kibble is a perfect Maltese puppy food. There’s plenty of protein for proper muscle development and lots of healthy fats for shiny and smooth coat and healthy skin. The formula is enhanced with vitamins and minerals and is specially fortified with calcium for strong bones and joints. The kibble is free from artificial colors, flavors and preservatives. 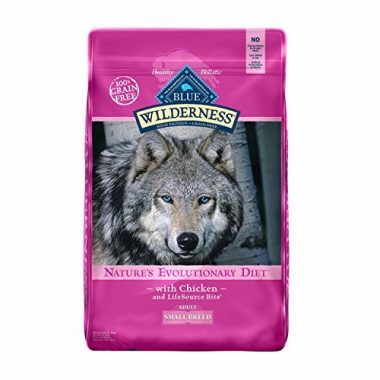 Like all Blue Buffalo dog foods, this Wilderness formula is inspired by the diet of wolves, who are true omnivores. The kibble is grain-free and specifically made for small breed adult dogs, so it’s a great choice if your Maltese has food sensitivities. The Blue Wilderness is made with chicken, sweet potatoes, peas, blueberries, cranberries and carrots, so it’s a perfect blend of complex carbohydrates, vitamins, minerals and antioxidants. Besides real chicken, chicken meal and fish meal are also there to boost the protein content. The kibble also contains added vitamins and minerals, so it’s a nutritionally complete dog food that you can trust. The are no poultry by-product meals present, nor is there corn, wheat or soy. The food is also free from artificial flavors and preservatives. 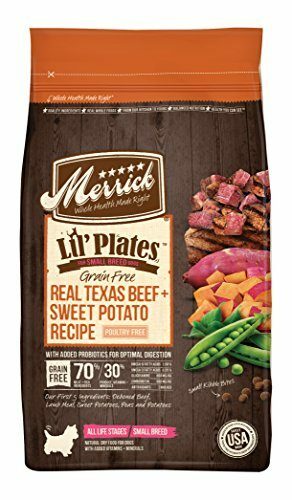 If your tiny pooch has the energy and appetite of a large dog, you need to check out the new Lil’ Plates recipes by Merrick. High in protein and healthy fats, this kibble is guaranteed to keep your energetic pup satisfied and happy. This particular formula is made of real Texas beef and sweet potatoes. 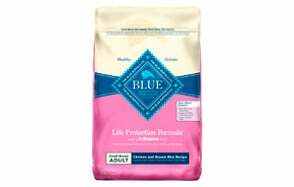 It also contains a few other, healthy and tasty ingredients, including lamb and salmon meal, peas, apples, blueberries, flaxseed and salmon oil. All in all, this is a colorful and flavorful combination of food that is sure to keep your pup properly nourished. But of course, that’s not all – the kibble is also enriched with vitamins and minerals and contains added probiotics for healthy digestion. 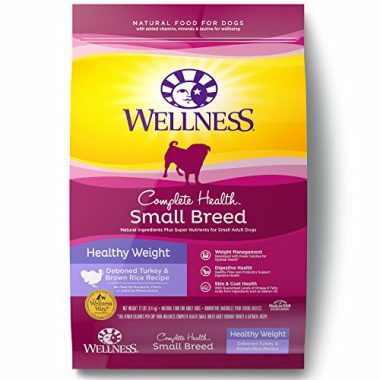 If your adult Maltese is starting to gain weight but you don’t want to deprive him of good, delicious food, definitely take a look at Wellness Complete Health dog food that is specifically formulated for breeds that need some help with their weight. This kibble contains tasty, nutrient-rich foods such as turkey, chicken meal, oatmeal, barley, brown rice, tomates, carrots, spinach, blueberries, apples and others, but is not high in calories. Instead, this unique blend of ingredients helps maintain a healthy weight in small breed dogs such as the Maltese. To provide a balanced and complete nutrition, the food is fortified with vitamins and minerals and contains plenty of fiber and probiotics for healthy digestion. There are no meat by-products here, artificial preservatives or flavors. 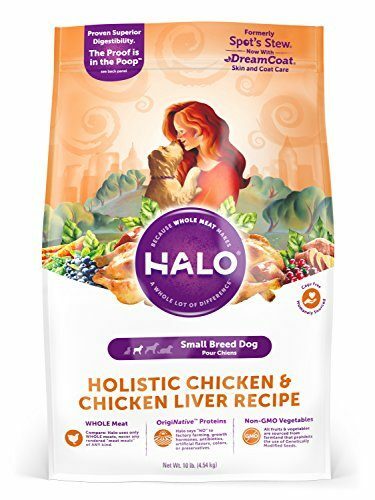 The Halo Pets is well-known for its good-quality ingredients in pet foods, and this particular formula, Halo Holistic for Small Breed Dogs, is no exception. Made with wholesome, nutrient-rich ingredients, this dog food features small, dense bites, perfect for smaller canines such the Maltese. This dog food is made from whole chicken and chicken liver and contains a few nourishing grains, fruits and veggies, which all combined make this kibble healthy, tasty and easily digestible. Halo makes a point of using only natural, non-GMO ingredients, as well as real meat, so you’ll find only good-quality ingredients here. Of course, the food is also enriched with important minerals and vitamins, so it’s a nutritionally complete dog food all around. The Halo Holistic doesn’t contain meat meal of any kind and is free of artificial flavors, colors and preservatives. One of the best senior dog foods on the market, the Orijen is a perfect choice for an older Maltese. Granted, this dog food is more expensive than the rest of the foods featured on our list, but when the ingredients are this good? Totally worth it. 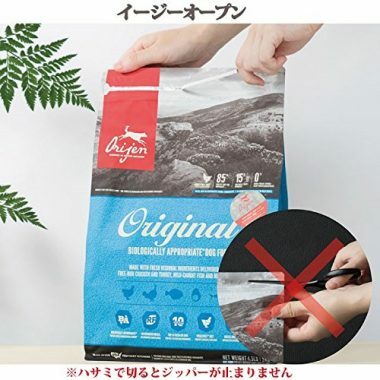 The Orijen Senior is a grain-free dog food that contains great-quality meat and fish, including deboned chicken and deboned turkey as its main protein sources and whole Atlantic mackerel and herring. Besides these ingredients, this protein-rich kibble contains a wide array of healthy ingredients, including whole green peas, navy beans, red lentils, chickpeas, butternut squash, kale, spinach, and many others. All in all, a true feast for dogs. What you won’t find in any Orijen’s dog foods are fillers, artificial flavors or colors. And because there are so many different, nutrient-rich ingredients, the kibble contains only one added supplement - zinc. 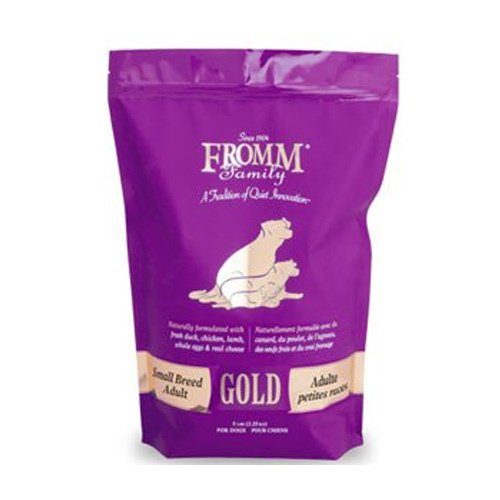 If your Maltese is ready for some new and exciting dog food but you still want only the best of quality, take a look at the Fromm Family Pet Food, and this particular Gold Small Breed formula which is specifically developed for the metabolisms of adult, small breed dogs. 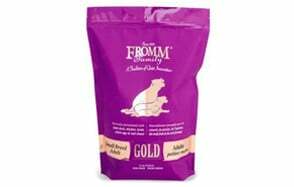 With ingredients such as duck, chicken, oatmeal, tomato, salmon oil, carrots, celery and potatoes, the Fromm kibble contains a balanced ratio of protein, fat and carbohydrates – just what an adult Maltese needs. The food is also fortified with vitamins and minerals and contains added probiotics to aid digestion. 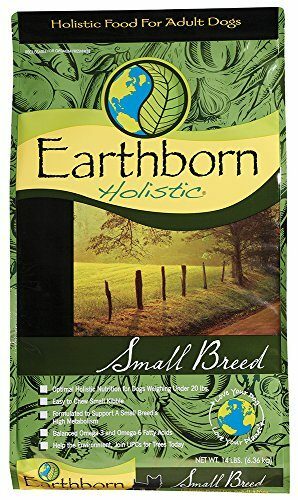 The Earthborn Holistic is specifically formulated for small breed dogs, including the Malteses. With quality animal protein sources and no grains of any kind, this kibble is ideal for highly energetic pups with sensitive stomachs. This dog food contains chicken meal and whitefish meal as its main protein sources, while highly digestible grains such as brown rice, oatmeal, barley and rye up the fiber content. There are a few fruits and veggies present as well, including sweet potatoes, apples, spinach, blueberries, and tomatoes. The kibble is also enhanced with vitamins and minerals and contains a wide array of antioxidants. With so many different products on the market, finding a reliable Maltese dog food can be a bit challenging. Hopefully, our Top Picks list was able to help you make up your mind, but if you’d like more information about what makes a great Maltese dog food – keep on reading. We’ve prepared this handy little buying guide and answered some of the commonly asked questions when it comes to buying dog food. Make sure you read it all, as the more informed you are, the better your purchasing decisions will be. Like all dogs, Malteses require good food to have a long, healthy, happy life. But what is good food for dogs, and specifically the Maltese breed? Your primary focus should be on wholesome, good-quality food ingredients in general. This means quality meat first and foremost, healthy fats and complex carbohydrates, meaning whole grains if your Maltese doesn’t have any stomach issues, veggies, fruits and some seeds (flaxseed is excellent for your pup’s coat!). Basically, the more healthy, wholesome ingredients, the better. Of course, there are always exceptions – if your Maltese has digestive problems, strange food allergies or skin and coat issues, it may be best to stick to limited ingredients. Like all breeds, Malteses thrive on moderate to high protein diets. But no any protein will do – look for real meat sources first, such as real chicken, turkey (deboned or whole), beef, lamb, fish, etc. It’s perfectly fine for a dog food to contain meat meals, by the way, such as chicken meal, fish blend meal, and so on, however, it’s wise to avoid meat by-products for Malteses. This breed is prone to some health issues if not fed only the best of foods, so stick to real meats as much s possible. To have healthy skin and coat, Malteses need plenty of healthy fats. So make sure the dog food you’re buying has at least 10% of fats listed in its analysis. Indoor pets may require less fat than usual, but active dogs who get plenty of exercise (and Malteses should get plenty of physical activity) need much more. Animal fat, salmon oil and flaxseed oil are all great fat choices. As mentioned, plenty of good-quality protein is a must for Malteses. For growing puppies, that’s at least 22%, and for adults, that’s at least 18%, as the AAFCO recommends. Now, this is a general recommendation for all dogs, but the Malteses are not different in this case – they need lots of protein to be healthy and happy. As a general rule of thumb, quality dog foods exceed these percentages. Fat is an important source of energy for all dogs, including the Malteses. Omega 3 and omega 6 fatty acids are crucial for your Maltese’s coat, skin, heart and brain health, so make sure the food you’re buying contains plenty of fats. For a Maltese puppy, fat should compromise at least 8% of its diet, while for an adult Maltese, at least 5%. Again, reliable dog foods exceed these recommendations. Some dog owners avoid carbohydrates in their pet’s diet like a plague, but canines are omnivores and need complex carbohydrates in their diet to be healthy and well. Carbs provide essential vitamins, minerals and antioxidants, so they’re an absolute must for most Malteses. There are exceptions, of course – if your dog has diabetes, then go for low-carb dog foods, and if your pup has a sensitive stomach, limit their carb intake to only basic ingredients. If your dog loves his food but you notice some of the fillers in the ingredients list, don’t throw it out immediately – if the rest of the ingredients are good, a little bit of fillers won’t hurt anybody. On the other hand, if you’re looking for only the best-of-the-best, avoid all fillers. Artificial preservatives, colors and flavors can be commonly found in pet foods. They help the food stay fresh longer, look and taste better, but they’re anything but healthy – especially for toy breeds such as the Maltese. They can cause stomach issues, nausea, poor skin and coat health and even some allergic reactions such as rashes and thinning coat. Avoid these ingredients at all costs, and instead look for natural preservatives. Meat by-products are animal parts that are not fit for human consumption, so anything from feet and claws to brains and intestines. Granted, these things are not unhealthy per se, however, with animal by-products, you never know what you’re getting. Still, if your pet is fine with a dog food that contains some by-products, we say don’t throw it out immediately – just make sure that’s not all your feeding your pooch. Eye problems: if your dog’s eyes frequently tear or swell, up their hygiene and see the vet for a checkup. Colitis: to avoid colitis, feed your Maltese only the best foods and make sure he gets regular wellness checkups. Heart problems: older Malteses may develop heart murmurs and other issues, so make sure your dog gets plenty of exercise. Also switch to low-sodium diet if the vet recommends. A: Although they may look all cute and innocent, Maltese dogs, even as puppies, are quite fearless and energetic. As such, they need constant stimulation, so make sure they have enough physical activity in their day-to-day life. Also be careful with the dog food you choose – because they are prone to certain health issues, Maltese puppies should be fed only the best of ingredients. A: For Maltese puppies: 3 meals a day, preferably always at the same time. For adult Malteses: 2 to 3 meals a day, depending on a dog’s level of physical activity. A: Maltese puppies need around 55 calories per pound of body weight, while adult Maltese dogs need around 45, although this too depends on the level of physical activity they have.